These downloadable pattern designing instructions are intended for use with your patterns drawn from the Sure-Fit Designs fitting and sewing kits. In this instance the kit used is the Dress Kit. 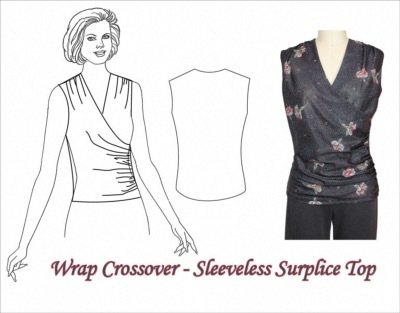 The Wrap Crossover Top is an excellent example of an asymmetrical design, meaning one side is different than the other. The instructions guide you through the set up of your pattern and how to clearly distinguish the opposing sides. In this example the top is sewn with a knit fabric and is intended to pull over your head. But if you wanted to sew it with a woven fabric, you'd simply need to plan for a center back zip. This top has been sewn in a sleeveless version, but it would be easy enough to add sleeves to this design if that is your prerference. Enjoy sewing with this digital Fashion Leaflet.